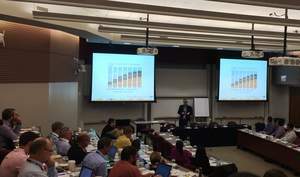 LEBANON, NH--(Marketwired - Jul 27, 2015) - Appcast, the first pay-per-applicant job ad exchange, today shared highlights from the inaugural Programmatic Job Ad Buying Summit, held on Tuesday, June 30, 2015 at the Gleacher Center in Chicago. Appcast was the founding sponsor of the event, which was hosted by the International Association of Employment Web Sites (IAEWS) and attracted more than 100 talent acquisition leaders and professionals from many of the top job boards and recruitment marketing agencies. With more companies struggling to connect with qualified talent -- and do so cost effectively -- the recruitment industry is in need of a new model. Just as customer advertising increasingly relies on programmatic ad buying to leverage data to target desired audiences with automated, customized messaging, more employers are seeking to adopt similar strategies to enhance their recruiting processes. Powered by data, programmatic ad buying enables companies to automatically place, manage and optimize recruitment advertising, improving ROI and enhance job candidate quality. The Programmatic Job Ad Buying Summit was established to address this market shift and explore the strategies and technologies that facilitate how employers can capitalize on this trend to find the talent their organizations need to be successful. A leader in developing pay-for-performance programmatic job ad buying technology, through which employers can easily advertise their open positions and pay only when someone applies, Appcast played a prominent role in the summit. In addition to sponsoring the event, the company's leaders shared their insight in several of the day's sessions. The summit began with a welcome and introduction session led by Chris Forman, founder of StartDateLabs, the parent company of Appcast, and Peter Weddle, executive director of IAEWS. They kicked off the event by welcoming attendees and setting the stage for a day of in-depth discussion on the current state of programmatic buying, its impact on employers and the job ad market, and what the future holds. This was followed by an engaging keynote by Matt Plummer, vice president, Programmatic Monetization for ZipRecruiter. In his address, titled "Now & Next: What the Jobs Space Can Learn from the Programmatic Revolution in Consumer Ads," Plummer gave an insightful overview of what programmatic ad buying means and how it applies to talent acquisition. Tom Chevalier, vice president of Product for Appcast, then presented a session, "Counting Clicks: The Technical Issues that Drive Complexity for Programmatic Buying on Job Ads," in which he explored the technical and infrastructure side of programmatic job ad buying. In addition, Kristen Jacobs, employment branding sourcing manager for Sodexo, shared insight from the employer side. Showing how employers can use programmatic job ad buying to enhance recruiting, she gave a first-hand account of how Sodexo built the metrics and infrastructure to enable in-house programmatic ad buying. Additional highlights of the summit were two panel discussions. The first, "Programmatic Ad Buying in Action," featured leaders from some of the most prominent recruiting marketing agencies today discussing how their agencies leverage programmatic ad buying to promote their clients' open positions. The second panel discussion, led by Chevalier, included representatives from leading job ad publishers addressing the challenges and opportunities introduced by programmatic job ad buying. "As employers strive to find new ways to identify, target and engage top candidates, programmatic ad buying has proven to be a highly effective and budget-friendly method for bringing the recruiting function to the next level," said Forman. "This event enabled us to show our audience how programmatic job ad buying will continue to emerge as the talent acquisition method of choice for progressive companies, and demonstrate how Appcast is paving the way with our industry-leading technology. Forman continued, "We are incredibly grateful to IAEWS for partnering with us to deliver the inaugural Programmatic Job Ad Buying Summit, and we are already hard at work planning next year's event." Appcast is a new way to advertise your open jobs on a 'pay-per-applicant' basis across a network of thousands of career and consumer sites. It works with all applicant tracking systems, requires no long-term contracts, and is simple to use. Headquartered in Lebanon, N.H. with offices in Cambridge, Mass., Appcast debuted in January 2014 and is the latest business incubated out of StartDateLabs. To learn more, visit: http://www.appcast.io. A leader in developing pay-for-performance programmatic job ad buying technology, Appcast played a prominent role in the Programmatic Job Ad Buying Summit.